134 MERCATOR, G./ HONDIUS, J. America sive India Nova. Amsterdam, 1630. Col. Pli central doublé, petite fente en bas du pli central restaurée. - Center fold backed on verso, for protective reason. Repair of split lower part center fold. Good impression. 366 x 461 mm. Je voudrais de plus amples renseignements sur le Lot N°63837 . 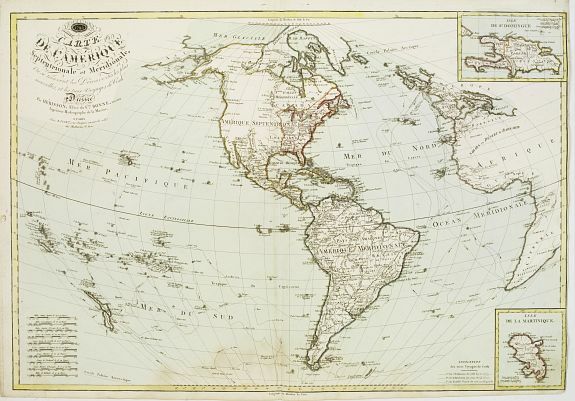 ¤ Carte du continent américain ornée de 4 médaillons en angles comprenant le titre, Cuba, Haïti et le golfe du Mexique avec le Yucatan. Le tracé général de la carte est dressé d'après la mappemonde murale de Rumold Mercator, de 1587. - This map was created by Michael Mercator, grandson of the great Gerard Mercator. It is the only map attributed to him. The map first appeared in 1595, one year after the great cartographer’s death in the atlas published by his son Rumold. The general outline of the map was taken from Rumold Mercator’s world map of 1587. Some of these unique views were incorporated – such as the mystical islands of the North Atlantic (St. Brendan), the bulge on the west coast of South America, and the inland lake of fresh water in Canada. Small rounded inset maps contain the title, Cuba, Hispaniola and the Gulf of Mexico. By 1606, the copperplate had been sold to Jodocus Hondius, who continued to publish the map for the next 33 years. This is an early Latin text example published by J. Hondius. Goss, North America, no.19: Burden, America 87. 135 BASSET Carte de L'Amérique Septentrionale et Méridionale ou se trouvent les Découvertes les plus nouvelles.. Paris, 1795. In original o/l colours. Good impression. Right hand margin cut close. Very light water stain in lower part. 525 x 770 mm. Je voudrais de plus amples renseignements sur le Lot N°23367 . ¤ Uncommon map of America, Western Europe and Africa showing routes of Surville, Cook, Vancouver and Mackenzie, prepared by Hérisson after R.Bonne. Showing the tracks of Captain James Cook. Insets with the islands of Martinique and St. Domingue (Haïti).